Of course I do get weather is hard to deal with for dark monos, it just looked like with the current themes it wouldn't be a big problem. But if you don't want it its up to you. Sorry if this info is elsewhere, I simply couldn't find it; what must one do to eventually become a gym leader? Obviously I'd have to stick around and show I'm not going to ditch the forum, as well as prove myself when it comes to battling, but I'd love to run a spooky-themed gym that uses ghost and dark types, and allows Smogon CAP Pokemon. Of course, I've just realised that I'm making assumptions here; it is possible to become a gym leader, right? 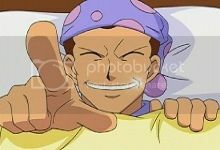 (06-25-2013, 07:08 PM)Fukai Tsumi Wrote: Sorry if this info is elsewhere, I simply couldn't find it; what must one do to eventually become a gym leader? Obviously I'd have to stick around and show I'm not going to ditch the forum, as well as prove myself when it comes to battling, but I'd love to run a spooky-themed gym that uses ghost and dark types, and allows Smogon CAP Pokemon. We have a festival coming up this weekend, and one of the events will be a tournament with the grand prize being a Gym Leader slot. So if you win the tournament, you can be a Gym Leader. There may or may not be other requirements, though. We've had several Gym Leaders make it into the League and then just spontaneously quit at a later time. You might want to contact @ninJAS for more information, as he essentially runs the League. (06-25-2013, 07:14 PM)Skye Wrote: We have a festival coming up this weekend, and one of the events will be a tournament with the grand prize being a Gym Leader slot. So if you win the tournament, you can be a Gym Leader. There may or may not be other requirements, though. We've had several Gym Leaders make it into the League and then just spontaneously quit at a later time. You might want to contact @ninJAS for more information, as he essentially runs the League. Well, I'll definitely be entering that, and hopefully winning, because I am certain that whether I do well in the tournament or not, I'd make a pretty good (and reliable) Gym Leader. I look forward to this upcoming tournament. Forgive me for asking, but I couldn't find out how one goes about becoming a Gym Leader? It'd be nice, plus anyone that remembers me must remember that I am pretty ferocious. You can become a gym leader by proving your battling skills against gym leaders and other trainers. Chances are if they feel you're a good candidate, it'll be discussed. There's also occasionally events with a Gym Leader position as a reward, like our upcoming tournament. It doesn't look like this was mentioned before but just to clarify.. This is both a DS AND PO gym league? Because there are rules for Pokemon Online, but then it talks about Genning and Savving. Can someone clarify for me? Currently our League only accepts battles using Pokemon Online or Pokemon Pokemon Showdown. Our rules have stayed the same as they were when the League originally opened (a few months after the forum was created) and we had different Gym Leaders then who were able to battle on DS as well. I'm about to do a rewrite of the rules, to make it look prettier and all that. Nothing will change except for the edit, mentioned above, that needs to be done. The infractions system is also set to be obsolete, since it was absolutely never used.